Dr Chioma Nwachuku is the General Manager Corporate Affairs & New Business Development at SEPLAT Petroleum Development Company Limited. She is a multi-skilled professional with over 20 years extensive experience spanning across various areas such as Communications, Product Development, Customer Relations, Human Resource Management and Academia. What drives your choice of social investment? We are spurred by an enduring vision and genuine commitment to our shared value philosophy. It motivates everyone in the system from the board members to employees. Our corporate view is that the issue of sustainability is one that must be integrated in our business strategy, by extension in our social investment to ensure long-term success. We are cognizant of the longstanding developmental challenges faced by the people of Niger Delta, which affected their perception and willingness to trust exploration and production companies that operate in their domain. As a result, from inception, we took a deliberate and bold initiative to build a positive sustainable brand equity underpinned by a shared value philosophy. We have, therefore, remained committed to implementing people-oriented corporate social investment initiatives anchored on good corporate governance and partnership with our critical stakeholders. Could you take us through the various forms of social interventions carried out by Seplat? Since inception, we have continued to act as a positive force among our stakeholders giving hope, providing healthcare, support to education and economic empowerment to community members particularly to the women and `youth. We have made notable progress in providing people-based high-impact development-oriented projects targeted at our five priority areas of health, education, community infrastructure development, youth and women empowerment as well as environmental stewardship. Our CSR programmes are well aligned with the Sustainable Development Goals and cater to the needs of various stakeholders. We have four major programmes we run on a yearly basis and other social interventions which have been incorporated as a part of our Global Memorandum of Understanding. All these programmes are funded through the NPDC/Seplat Joint Venture. Let me share some of our very notable signature CSR programmes in two sectors. The Eye Can See (ECS) programme is a high-impact health programme and is in its seventh year of offering eye care for persons in SEPLAT’s communities. The programme provides surgeries, prescription glasses and eye medication, as well as, offering counseling and medication for persons living with hypertension and diabetes in addition to having eye problems. The programme provides premium eye care through select medical practitioners comprising Ophthalmologists and Cardiologists who diagnose and care for treatable conditions, and provide preventive care. Although, the programme is for persons in our communities we have, however, witnessed that individuals in surrounding villages and states do come to take advantage of this programme to treat their eye problems. The programme, has indeed become a high impact programme. It eliminates patients’ barriers to accessing eye care and surgery by fully funding cataract surgeries, bringing eye care services to the patients, educating communities about elimination of blindness and advocating lifestyle changes in the case of persons living with Hypertension and Diabetes. provides the platform for educating the recipients on any selected theme. Safe Motherhood since inception has focused on: Providing delivery kits, insecticide treated nets and food supplements to expectant women; providing an interactive platform to learn about danger signs, hygiene and nutrition in pregnancy and the importance of breast feeding; vaccination and deworming of children; Introducing Child Spacing and the benefits of family planning; revitalizing primary health centres by driving traffic to them and educating traditional Birth Attendants on modern and safe delivery methods. 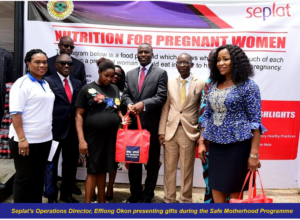 SEPLAT, upgraded the Female and Children’s Ward at Central Hospital Sapele by renovating and supplying medical equipment as an extension of the Programme to ensure recipients of the programme and other expectant women access a good hospital at time of delivery. On Education, SEPLAT’s drive to encourage academic excellence in our youth gave rise to the introduction of two signature CSR programmes – Pearls Quiz and National Scholarship; both programmes are designed to improve the quality of education in our host states and the nation at large. PEARLs which stands for Promoting Exceptional And Respectable Leaders is SEPLAT’s educational CSR programme aims to reward academic excellence engendering the spirit of competition amongst public and private secondary schools. This programme remains well received and we have the confirmation that it directly impacts academic performance as students while preparing for this competition are encouraged to read their syllabus intensively. The programme is currently deployed at Delta and Edo States, our host states. SEPLAT’s drive to further encourage and motivate academic excellence saw the introduction of a National Scholarship Programme for students in tertiary institutions in Nigeria in 2014. The SEPLAT JV National Scholarship Undergraduate scheme is merit based and is designed to provide scholarship to indigent students. In the past 4 years, SEPLAT has awarded scholarship to indigent students’ at various universities nationwide thereby providing opportunities for indigent students to fund their studies. SEPLAT also has in place, since commencement of operations, post-primary scholarship programme for indigenes in its host, impact, access and pipeline communities. Among these, which is the choice one you’ll always refer to? Which of them has been very effective? His Excellency Governor Ifeanyi Okowa of Delta State, speaking through his commissioner for Basic and Secondary Education Mr. Chiedu Ebie stated ‘ it is commendable that Seplat over the last seven years has successfully held this competition and has been awarding scholarships in secondary and tertiary schools”. His Excellency, Mr. Godwin Obaseki, Executive Governor of Edo State, recently celebrated Students of Presentation National High School and University Preparatory Secondary School (UPSS), both in Benin City, Edo State, for emerging winners of the 2018 NPDC/SEPLAT PEARLs Quiz in the first and third place category, respectively. Governor Obaseki, while hosting Students of the winning Schools in his Office at Government House, Benin City, Edo State, gave cash prizes to the Students for their exceptional performance at the competition. So you can tell that these programmes have all been very effective which is why till date we continue to deploy them so as to close their needs in our communities. The most impactful truly may be difficult to say. The Eye Can See programme could be in view of the sheer numbers of recipients and its immediate impact on a visually impaired person whose sight is restored therefore freeing the person to be less dependent on others. But this would be a close call as the Seplat’s Pearls Quiz also offers sustainable benefits which go directly to the participating students and the winning schools where we use their prize money to implement projects selected; for example, build/renovate a library or a computer laboratory. What has been SEPLAT’s strategic plan as regards social investment since inception and what does the next 5 years hold? As a deliberate corporate strategy, we consistently deploy stakeholder-inclusive corporate social responsibility and sustainability practices that are designed to meet stakeholder expectations and deliver solutions to identified societal challenges. Our long-term sustainability aspiration is to create and deliver shared value to our critical stakeholder groups. Driven by this shared value philosophy, we work to ensure the sustainability of our business and our critical stakeholders. We will stay true to our commitment to impact the lives of members of our host communities and other stakeholders. Awesome! So how do you measure the effectiveness of your social investment spend? We run periodic evaluation of our social investment programmes to access the benefits versus the spend. This social impact assessment is carried out by an independent body.But also important is an assessment of how well our programmes achieve the set objectives. Ultimately, any initiative should positively impact the lives of recipients and the community at large. What would you say has been the significant impact of your social investment plan on your host communities? Since inception, we have touched the lives of thousands of host community members and other stakeholders with people – based interventions. We have continued to deploy high impact community projects and programmes which have improved the living conditions of many families. An evaluation of the impact of our CSR programmes among stakeholders showed impressive results in the areas of health, education, infrastructure development and others. It also showed a positive perception of SEPLAT among stakeholders and their willingness to continue to partner with us. It has continued to engender trust, mutual respect and understanding between us and our various publics. The success of social investment has also brought very real and measurable business benefits. Indeed, it has contributed immensely to our sound corporate citizenship profile which has given us a competitive advantage. The impact of our Social investments in the host communities has been massive and quite impressive, they include: Improved health and quality of life generally enhanced; greater awareness in preparation for WAEC as a result of the Pearls Quiz; indigent undergraduates are assisted through university with the scholarship scheme; a major drop in maternal and infant mortality rate as the women embrace orthodox medicine through Safe Motherhood and access to better equipped functional health centres. Are there areas for improvements? Of course, there are always areas to be improved upon; absence of amenities that could improve the quality of outcome of our programmes bothers us. For example, access to health centres for ante natal, eye care and other ailments when our health programmes are not in session. We have tackled this problem by renovating two health centers but more needs to be done. Also, we continue working on embedding sustainability in our social intervention so that the communities take up ownership of programmes and social investments. Any improvement with the literacy level in the communities will enable them effectively buy into programmes that improve their ability with skills acquisition, training and employment. We are constantly working on how to promote sustainability, for example ensuring our targets particularly the women and youth become self-reliant through our interventions. How important is it for companies, especially Independents, to engage in social investment in their host communities? What advice would you give? I believe most companies know the relevance of undertaking social investment in their host communities. For us at Seplat, we have built strong relationships with our key local communities, promoting trust and confidence amongst our various stakeholders, ultimately resulting in a stable operating environment. What has worked well for us is remaining resolute with our commitment to creating a shared value. This has continued to motivate us undertake corporate social investment initiatives that improve the living conditions of our local communities.